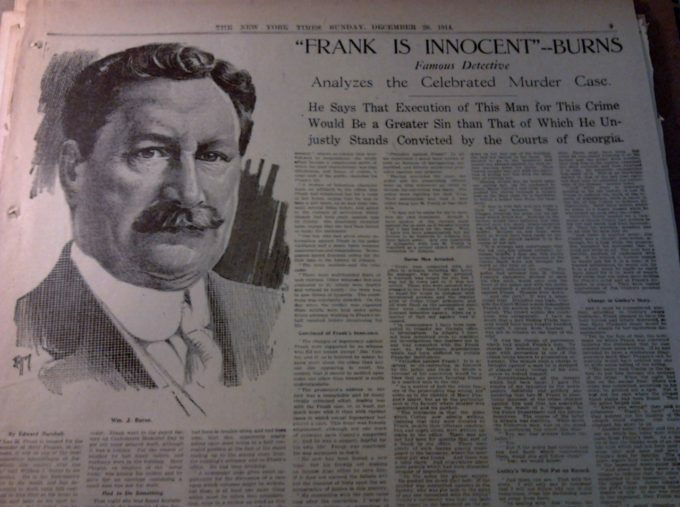 The New York Times published reams of blatant pro-Frank propaganda, such as this piece lionizing crooked detective William J. Burns. TO HEAR the attacks made on the character of James Conley — a major witness against Leo Frank when Frank was tried for murdering a 13-year-old girl in his employ, Mary Phagan — you could easily be forgiven for assuming that you were hearing a speech from a Grand Wizard of the Ku Klux Klan instead of the words of B’nai B’rith-associated Frank and his defenders, so harsh were the racial attacks and epithets used against the Black man. Such was the race-baiting nature of the immense nationwide publicity campaign waged by Jewish advertising executive Albert Lasker and his willing “fake news” allies in the media, such as the New York Times‘ Jewish publisher Adolph Ochs.